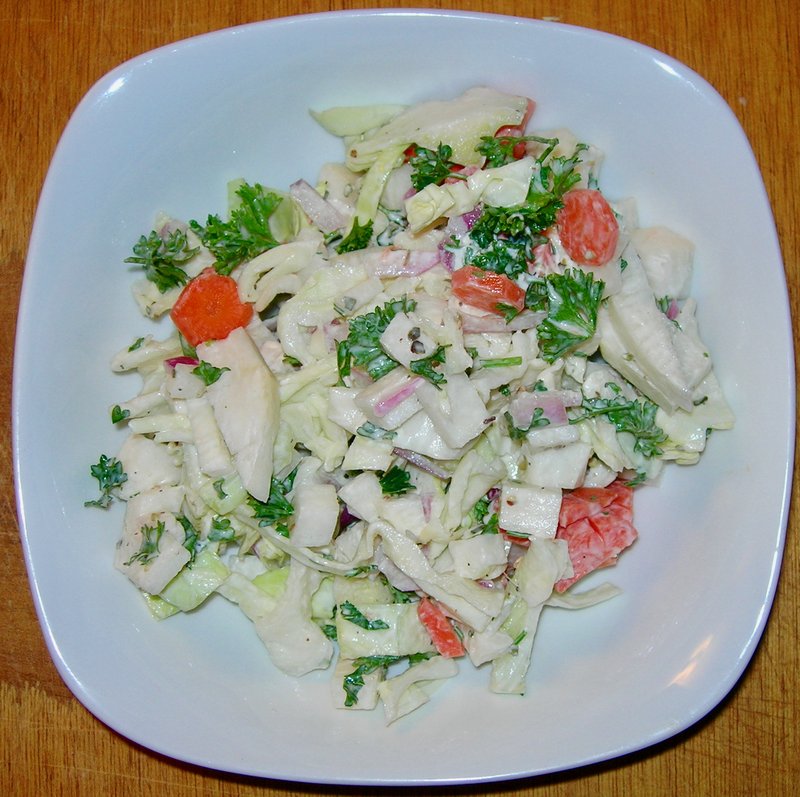 The other day I made a delicious salad with turnips and cabbage, but it did not look as delicious as it tasted because it lacked color. I decided to use red onions instead and add some carrot and parsley. Now it’s even more delicious, the carrots and parsley adding flavor as well as visual appeal. Chop and mix the following in a bowl. 4 cups of shredded cabbage. Salt lightly and let sit in a colander for an hour, squeeze out the liquid and mix in the rest of the vegetables. Mix up the dressing and add, coating all the vegetables and refrigerate for at least one hour to allow the dressing to marry with the salad. When serving, sprinkle a small handful of sunflower seeds on top. There is a lovely mix of earthy and bright flavors. The slightly creamy dressing is not too rich, using yogurt makes it slightly lighter than just mayonnaise and adds that tang of yogurt. The earthy flavors of oregano and parsley make the salad extra satisfying. It is also tasty without the sunflower seeds. 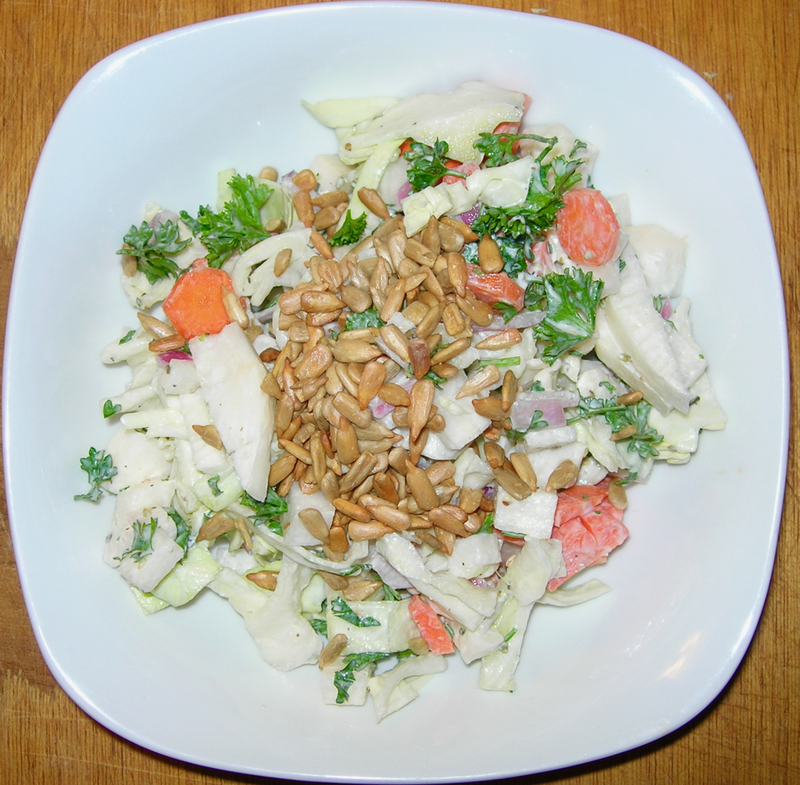 This was a quick and easy slaw using some Spicy Peanut Dressing I made the other day. So I sliced up a salad bowl full of cabbage, diced up two dried figs. Tossed with the peanut dressing. Delicious. The mix of spicy heat and sweetness and citrus tang make this a great salad dressing. Cabbage is friendly to just about any dressing and the dried figs add just a perfect contrast. This is from last month and I am slow to blog it. It was too hot to bake anything, but I had a 3 pound pork shoulder roast to cook. I decided to make pulled pork on the stove top. I don’t have a Dutch oven, so I used my soup stock pot. I put it on medium heat with 2 TBSP of olive oil. I added the roast and browned it on all sides before removing for a few minutes. I wanted it to be browned but also wanted to develop flavors before adding the meat and did not want to use two pans. I chopped up a yellow onion, added it to the oil, with some salt and pepper and sautéed until tender. I tossed in 4 cloves of garlic and about 4 TBSP of Jamaica Jerk seasoning. Yes, that much! I then added 2 cans of diced tomatoes and 2 cups of vegetable broth. I heated everything, stirring and then put the pork back in and let it simmer for a few hours, checking repeatedly until it was falling apart and tender. This was just amazing! So flavorful and not at all too spicy. 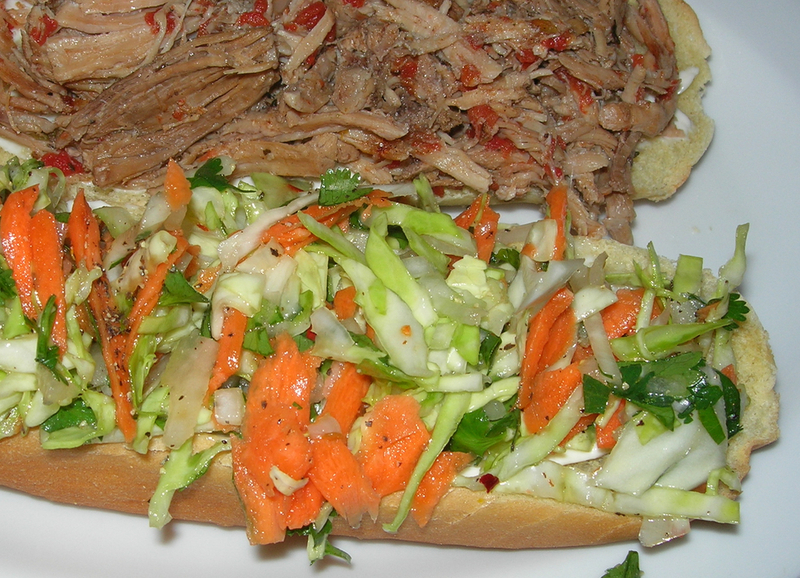 This makes a lot of pulled pork that you can use for all sorts of delicious things. 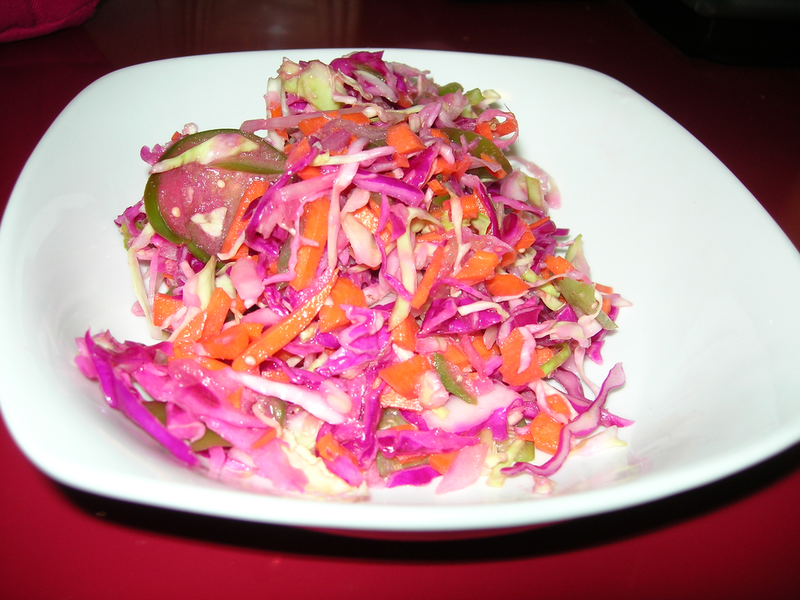 I made a simple slaw of sliced cabbage, diced onions, salt, pepper and oil and rice vinegar. 1/2 tsp of seasoned rice vinegar. I grilled two flour tortillas using the electric coils on my stove. You have to keep a close eye, do not walk away and have the exhaust fan going on high to avoid setting off your smoke alarm. 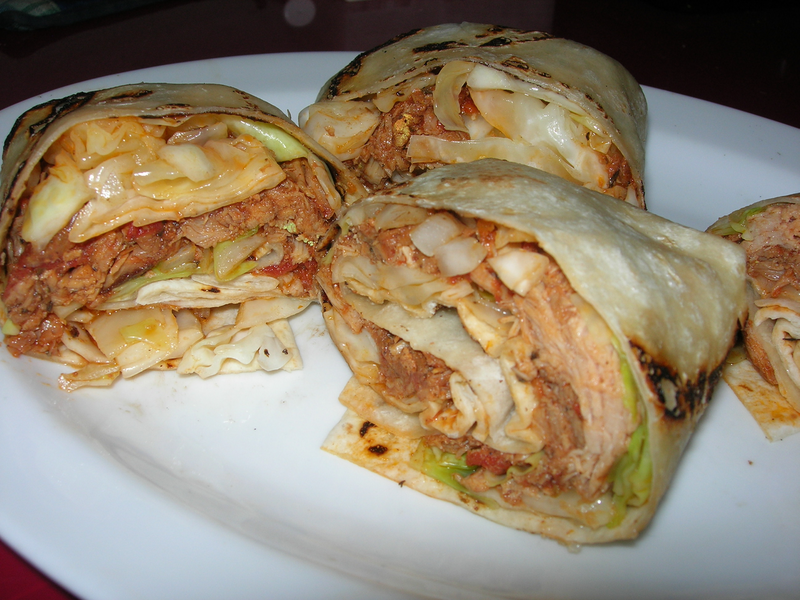 After grilling the tortillas, I put half the slaw on each tortillas, and then put a half cup of pulled pork on each, rolling up and cutting in half. 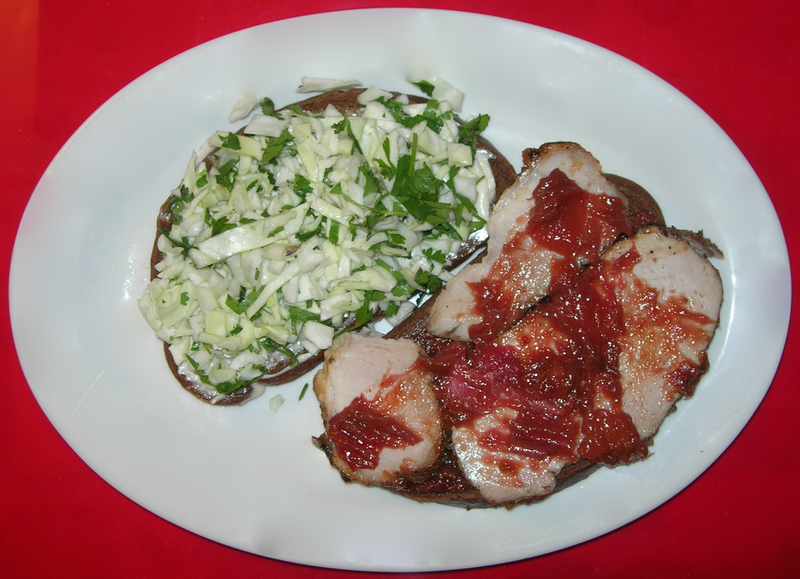 It was delicious, meaty and fresh and crunchy with the cabbage. So this is going into my regular rotation and will be made again and again and again and again and again. It’s a flavor sensation as they say. First, I love cabbage. It’s my favorite vegetable and I would eat it ever more often that I do, but I already eat it more than I should as it tends to upset my stomach a bit. If not for that it would be perfect, sharp and peppery in its own self and so ready to blend with other foods, to accept and incorporate seasonings and dressings. Delicious cooked or raw, hot or cold and with all that, it’s inexpensive and keeps well stored in a cool, dark place. So yeah, it’s great stuff. But wow, this makes it even better. So, I cut up about 1/2 a head of cabbage, about 8 cups of cabbage. I cut the onion in thin slices. I heated a cast iron skillet on a low medium with NO oil. I added the sliced onions and stirred them steadily so they did not get any char. I wanted a light caramelization that sweetened the onions without softening them too much. That’s why no oil and the medium low heat. In another dry pan, I toasted the pepitas until they began to pop and turn toasty brown. When the onions and pepitas were cool, I mixed them in with the cabbage. I mixed the rice vinegar, white wine and the Jamaica Jerk and the bit of sugar. I mixed them together well, poured on the salad, put a lid on the bowl and shook really hard because there’s not a lot of dressing to coat everything. I stuck it in the fridge for a couple hours so the vinegar “cooked” the cabbage. Every time I happened to walk by I shook it some more because there really is not any extra dressing, so it needs some shaking. This made 8 servings and you know what? The last serving did not sit in a pool of dressing. This kept the salad nice and crisp, but rich in flavor. Jamaica Jerk is spicy, so adjust to your taste. It leaves a delicious wonderful aftertaste, too. I was passing the radishes at WinCo and saw how big and beautiful they were, unblemished and at their peak. I could not resist grabbing a bunch. I also got two big heads of cabbage and about a pound of cilantro at the Oregon Food Bank’s Harvest Share so I really needed to figure out something to use them. I remembered how La Sirenita would add slices of radish as a garnish and got this crazy idea of making a Mexican cole slaw. I looked at a few recites for ensalada de repollo, but didn’t find anything that appealed to me. 1/2 head of cabbage sliced thin, salted and rested in a colander for 20 minutes. Squeeze out liquid. Mix well using blender or Magic Bullet. So, the traditional ratio for a vinaigrette is 3:1 oil and acid (vinegar) and this is closer to 1:1 with the lime juice. But that’s how I like it, I am happy with just vinegar, but it really needs the oil to make the vinegar adhere to the veggies and suspend all the spices, so I never do 3:1 even if that is the proper ratio. Cooking is about personal preferences and I will use a Magic Bullet to help these emulsify even though the ratio is out of balance. It is what I like. For a more traditional dressing, 3 TBSP of olive oil to 1 TBSP of vinegar. This is not a single serving because this salad tastes better the second, third and fourth days. It makes 8 to 10 servings. I love this on a tostada with some broiled carne asada. I sliced 1/4 head of cabbage into thin ribbons and chopped up an equal amount of fresh kale in similar thin ribbons. In a large pot, I brought 2 cups of water to a boil with a teaspoon of salt. I added the cabbage and kale and put a lid on it, letting them cook for one minute. I strained the water off and set them in the fridge to cool. Meanwhile, I sliced up 2 plums and sautéed them in 2 TBSP of white wine vinegar and 2 tsp of soy sauce with 2 tsp of Tajín. I added a bit of salt and pepper, a tsp of sugar and stirred until the plums were just about to break down, but were still holding together. I poured the dressing on the kale and cabbage, stirred and set back in the fridge to cool. Before serving, I toasted the pepitas in a bit of peanut oil with smoked paprika. This made two large servings or four small salads. 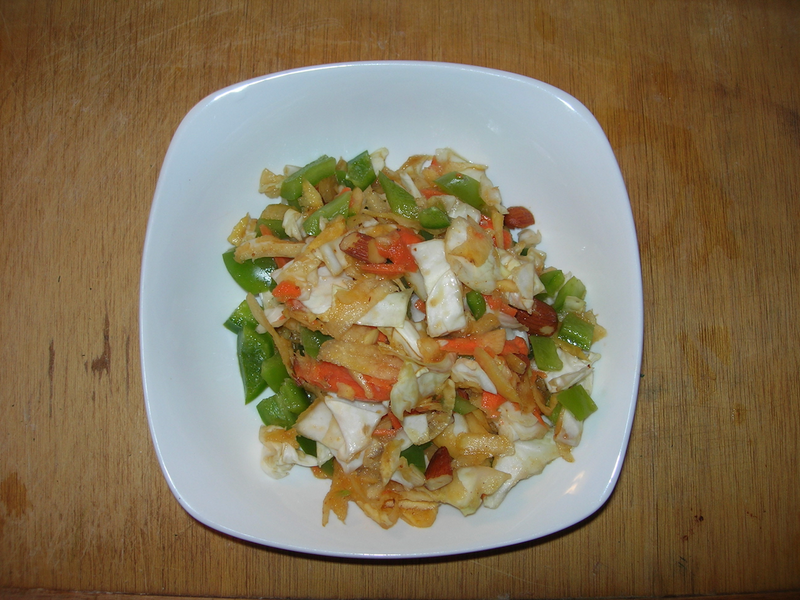 It’s a great blend of hearty veggies, sweet fruit and tangy vinegar. The pepitas add a bit of crunch and umami.